Welcome to Managing AML, I am Dr. Joseph Khoury from the University of Texas MD Anderson Cancer Center. In this clinical snapshot, I will be discussing the case of a 53-year-old woman who presented with severe fatigue and bruising over several weeks' duration. The patient had no significant prior medical or surgical history. At presentation she had pancytopenia with circulating blasts seen in the peripheral blood. Her bone marrow evaluation included aspirate smears and clot preparation, a trephine biopsy from the posterior iliac crest and touch preparations, flow cytometry, cytogenetics, and molecular diagnostics. Bone marrow evaluation in this patient, as you can see in these images, demonstrated a hypercellular bone marrow that is most notable in the top left portion of the slide. The marrow is replaced by immature cells that overtake the normal hematopoietic elements of the bone marrow. The bigger portion of the slide demonstrates a bone marrow aspirate smear in which many immature cells are identified. These immature cells have irregular nuclear contours and a chromatin pattern (the purple portion of the cells) that we refer to as “open.” The cytoplasm is fine blue and contains occasional elongated red colored structures. 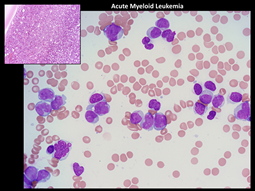 The diagnosis in this case is acute myeloid leukemia, or AML. The presence of Auer rods is pathognomonic of myeloid neoplasia or a myeloid malignancy. In this case, the number of blasts exceeds 20%; and thus, the patient qualifies for a diagnosis of AML. Myelodysplastic syndrome would be a possibility if the blast count was under 20%. In this case, the immature cells comprise the vast majority of the cells of the bone marrow; and thus, myelodysplastic syndrome would not apply. Post-viral myelosuppression would not include replacement of the bone marrow by leukemic blasts and so, in this case, it would not be a correct answer. 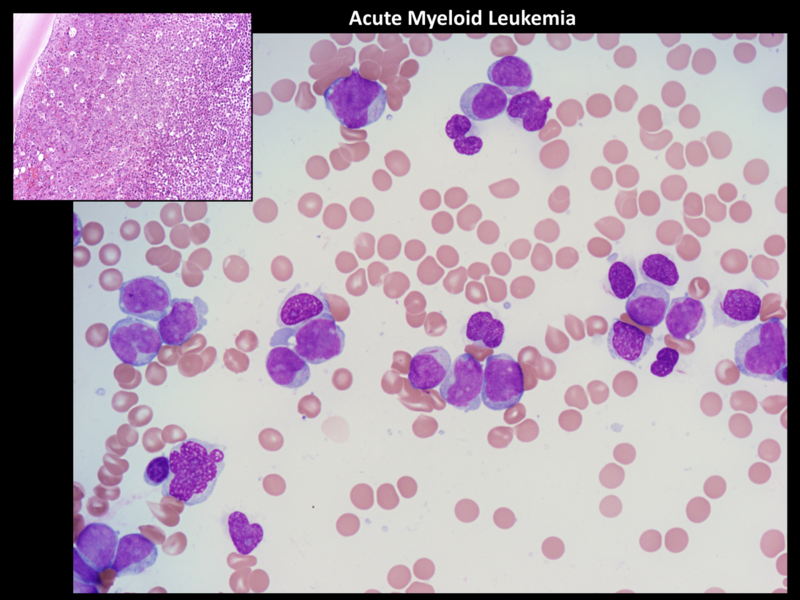 Similarly, although reactive myelomonocytic hyperplasia can be seen in certain conditions, it does not include the presence of atypical cells and, more importantly, cells that include Auer rods (the red-colored elongated structures within the cytoplasm of the leukemic cells). The complete workup of any patient with AML should include morphologic examination of aspirate smears ideally coupled with a clot preparation, as well as a trephine core biopsy coupled with touch preparations. In addition, routinely patients suspected of having AML should be evaluated with flow cytometry, cytogenetics and molecular diagnostics. Thank you for listening to this activity.